There are so many fungal disorders that can attack our plants, it can be hard to sort them out. Pecan vein spot disease is caused by the fungus Gnomonia nerviseda. It is not considered a common or especially dangerous disease, but it can cause severe defoliation which affects overall tree health. 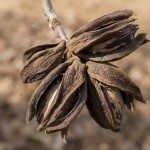 The disease does not appear on shoots or nuts, only foliage and only in pecan trees. The good news is that the disease is infrequent, causes little crop loss and can be prevented or minimized in most cases. What is Pecan Vein Spot Disease? Pecan pie, pralines and more are all delicious treats brought to you by a pecan tree. Noting pecan vein spot symptoms and acting promptly can help protect the yield of those tasty nuts. With good cultural care and some basic hygienic practices, treating pecan vein spot is manageable. There are no listed cultivars that are completely resistant but a few seem to be less susceptible and should be considered as replacements for those that are consistently infected. Pecan vein spot symptoms resemble another common disease of these trees, pecan scab. The first lesions are tiny, black to dark brown spots. In leaflets, the spots are centered at the midrib. As the lesions mature, they can become elongated along the vein. Vein spots are shiny and linear when observed in the sun while scab is dull matte and round. Vein spots rarely get any larger than 1/4 inch (.64 cm.). The leaf petioles may also become infected. After a while, the leaf will dry and fall off the tree. Extreme defoliation can affect the plant’s ability to photosynthesize and compromise its health. <[email protected]>What Causes Pecan Vein Spot? The spores of the fungus are released into the air after rains, generally from early spring into August in some regions. The first lesions are often visible by May. The fungus overwinters in infected plant material and requires moisture and warmer temperatures to produce spores. The spores are released and carried by wind and rain splash. The fungus seems to affect trees in areas with little fertility and those low in zinc. Any of the cultivars that have good resistance to pecan scab and other leaf diseases are also resistant to pecan vein spot. Treating pecan vein spot starts with good tree care. Those that have proper nutrients and good care are more likely to be unbothered by the fungus. In minor infestations, simply remove the infected leaves and dispose of them. Use recommended amounts of fertilizer, as low nutrient trees are prone to develop the disease. Clean up dropped plant material at the end of the season. Any fungicide listed for use against pecan scab is recommended for pecan vein spot control. Apply early in the season and again just prior to fruit formation.